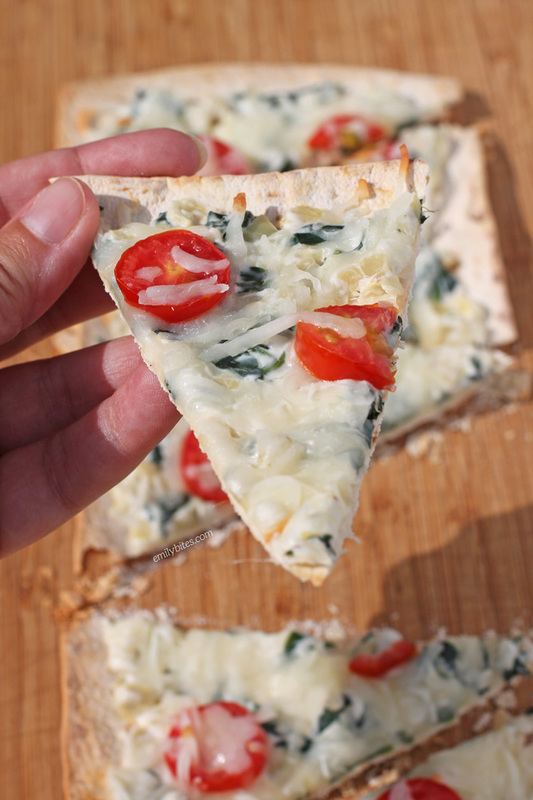 These Spinach Artichoke Flatbreads give you all the creamy, cheesy deliciousness of your favorite dip baked over a thin, crispy pizza crust – no chips required! 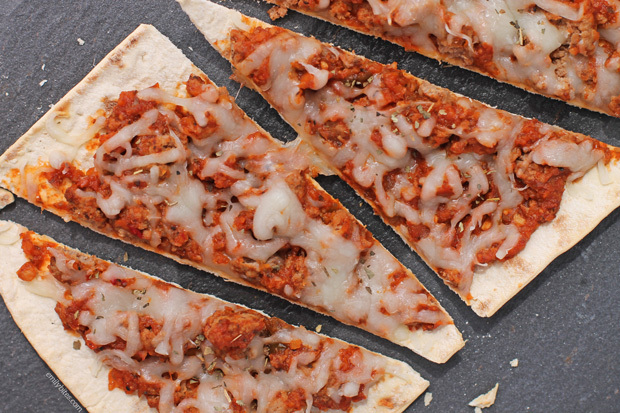 These flatbreads come together very quickly and it’s easy to double or triple the recipe to serve as a family dinner or as a tasty handheld snack at a party or during the big game. I added tomatoes on top for fun and color but you could easily omit them or replace them with other veggies you love or with chicken or steak to satisfy the meat-lovers in your house. I have always been a thin crust pizza lover, so flatbread pizzas are right up my alley. As many of you know, after loving Flatout* flatbreads for years and using them in recipes like my Bacon Cheeseburger Wraps and Chicken Pesto Wraps, I started working with them this year to develop recipes. So far it has been a match made in Heaven! I’ve made recipes for Chicken Pesto Flatbreads, Chinese Chicken Wraps and Mexi-Burgers with Guacamole as well as a few recipes for Flatout’s blog including Baked Chicken Parmesan Sandwiches and Hawaiian Ham and Cheese Melts. Just a couple weeks ago I had a request from a reader for more flatbread pizza options and I was more than happy to oblige. I love using these Artisan Thin Crust flatbreads because they taste great and they make perfectly crispy pizza in the oven in just 6-7 minutes. Can’t beat that! Plus since the crust is only 120 calories you can get creative with tasty toppings and still feel good about eating the whole thing. Want to try making these right away? You’re in luck! Flatout is currently offering a $.50 off coupon to try their products. Click here to print your coupon! *I have partnered with Flatout to create this recipe. I have been compensated for my time commitment to work with their product, however my opinions are entirely my own and I have not been paid to publish positive comments. 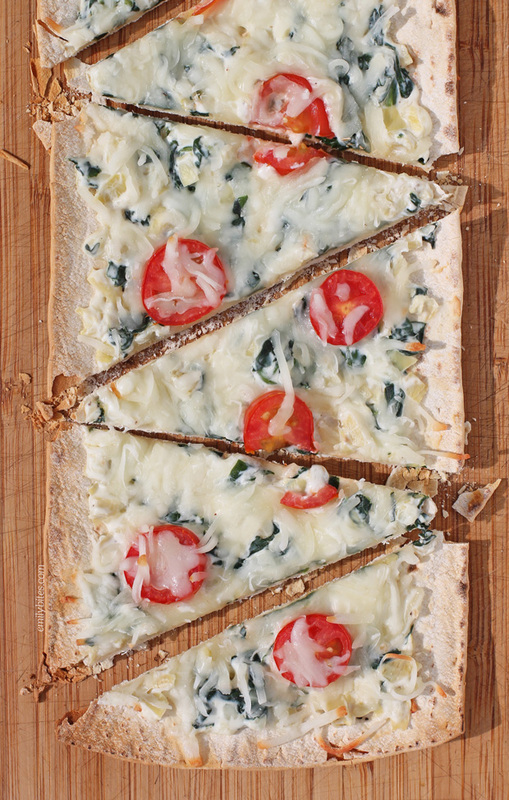 Looking for more ways to use the Artisan Thin Crust flatbreads? I’ve got you covered! I’m not just bringing you one new flatbread pizza recipe, I also did a guest post over on Flatout’s blog with a recipe for Sloppy Joe Flatout Pizzas. Make sure to check it out! Lightly mist a small skillet with cooking spray and bring to medium heat. Add the spinach and cook for about a minute. Add the minced garlic and cook for an additional 30 seconds or until garlic is fragrant and spinach is wilted. In a mixing bowl, combine the spinach and garlic with the cream cheese, sour cream, ¼ cup of the Mozzarella, artichokes, black pepper and red pepper flakes. Stir until well combined. When the oven is pre-heated, place the flatbreads directly onto the middle rack of the oven and bake for about 3 minutes until they stand firm when lifted. Remove from the oven and divide the cream cheese mixture between the two flatbreads. Spread in a thin layer across the surface leaving a bit of room around the edges for a crust. Sprinkle with the remaining Mozzarella, grated Parmesan and add the tomatoes over the top. Return the flatbreads to the oven, directly on the rack (make sure no ingredients are hanging over the edge). Bake for another 4 minutes until the flatbread is lightly golden and cheese is melted. Slice with a pizza cutter and serve. I love the Flat-Out products. Will have to check and see if they have this crust in 100% Whole Wheat too………if they don’t…they SHOULD!!! I made this for dinner tonight and it was amazing! I used the whole grain with flax (I think that’s what it’s called) version of the flat out and the whole thing was delicious. Will definitely be making this again. Thanks! I am diabetic and as a result must seriously watch my carbs. Is the 38 grams of carbs on your flat out flatbread pizzas for one slice or the whole flatbreads? I love your blog and your recipes. Keep up the good work! Hi Cheryl, the nutrition information is for one whole flatbread. Hope that helps! I’ve made this flatbread twice now and its awesome. Wow…this was awesome!!! I used the WW Flatout and did not cook the spinach first (only because I failed to read the recipe before I mixed ingredients together) and it delicious! I will definitely make it again. When do you add the rest of the Mozzarella? Oops! Over the top. Fixed! This was super easy and so good! Definitely pinning it onto my list of favorite “successful” recipes! So happy to hear that, Nicole! Thanks for posting. Yum! Made these for a light lunch before the big Thanksgiving dinner, and they were a huge hit. We doubled the recipe, and I splurged and used the whole can of artichokes. We’ll definitely have these again (maybe even this weekend, since we have spinach left). Thanks!! can you assemble and later bake? I wouldn’t assemble the flatbread too long before baking because you want the crust to stay crisp, but you can definitely make the spinach dip ahead of time and just spread it on during the assembly!